Upon peeling back several layers of the reality onion in the mid-to-late 1990’s, we were convinced way back then of the Twilight Zone reality that the world had come to embrace. 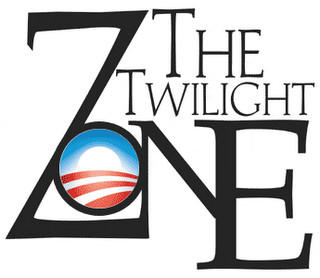 Given all that has transpired since then, we are now well beyond the Twilight Zone. It’s been a long, long time since financial markets have reflected what’s actually taking place in the world around us, and as such, it’s been a similarly long time since we've bothered attempting to try and correlate the two. Beyond this rather bizarre decoupling of markets and reality, all that remains as a reliable gauge for measuring the progress of financial markets within the current zeitgeist, is price and trend. Fortunately or not, depending on one’s perspectives, on paper, price and trend trump everything less. The following is another brief sample of what readers will find in Elliott Wave Technology’s FREE Mid-Term Outlook. You can register to get the balance of this edition and future issues of the Mid-Term Outlook from the Elliott Wave Technology homepage. 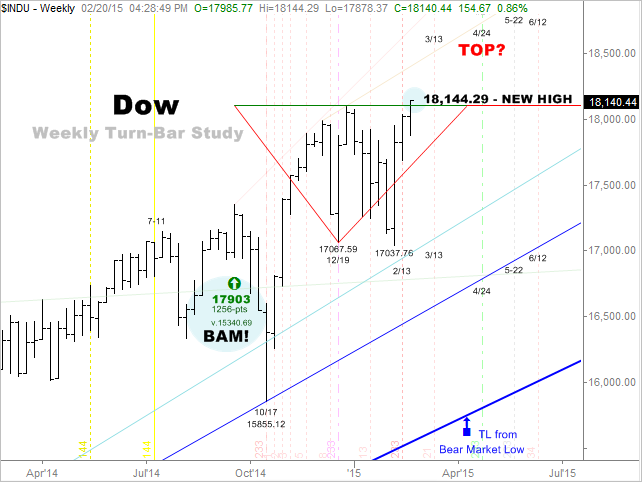 Vertical dashed lines on this chart of the Dow mark potential timing points for turn-week pivot highs or lows. The margin of allowance for such turn pivots is +/- one or two bars. In our previous update, the next plausible turn week for the Dow was forecast to occur the week ending February 13, +/- one or two bars. As the current update shows, after nearly a month of wild rollercoaster swings, the Dow indeed marked a pivot low within the bar preceding the week ending February 13. Since then, the Dow has gone on to print fresh historic highs against a backdrop of stark realities that simply numb the mind. The next turn week forthcoming is that of the week ending March 13, 2015. Once again, you can register to get the balance of this edition and future issues of the Mid-Term Outlook from the Elliott Wave Technology homepage.